The Stark Online: Is It Matthew Houck's Time? Is It Matthew Houck's Time? There are often signifiers that come along with great records. Sometimes it's the current market climate, the artist's career to date, collaborations, producers, a certain "phase" that an artist is going through. Right now, everything seems to be pointing in the direction that Phosphorescent's new album Here's To Taking It Easy (May 11, Dead Oceans), is going to be Matthew Houck's full-on arrival as one of the elite artists on the indie rock scene; to be mentioned in the same breath as an Andrew Bird, M.Ward or Justin Vernon. Of course, that's the way it seems. 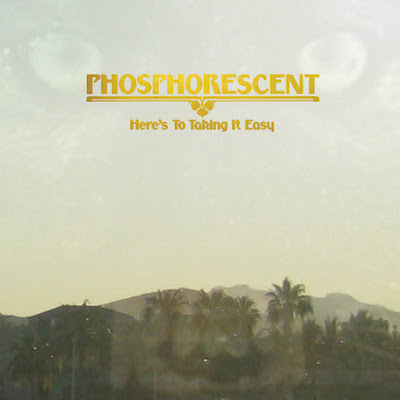 After his surprising, and surprisingly great Willie Nelson covers record To Willie, Here's To Taking It Easy represents the first full album of new Phosphorescent material since the haunting and ethereal Pride. The press release references albums such as Street Legal and On The Beach to describe the new Houck material. Material that finds Houck supported by musicians galvanized by the music coming out of LA during the fruitful years surrounding 1975, when East Coast folk-rock icons like The Band, Joni Mitchell, Clapton and the aforementioned Dylan and Young abandoned the freezing climes of New York, for the sun and drugs of California. If Here's To Taking it Easy comes close to the magic captured on those classic records from the 70s then this album could truly be Houck's grand coming out party. Yet, even if the album doesn't contain a "New Pony" or "Revolution Blues," it's sure to satisfy, as Houck is a true songwriter and artist. He has that great album in him. It remains to be seen if this Here's To Taking It Easy is it, but we're hoping.